Size: approx. 3-5 mm. Photo: 05/25/12, 10 pm. Norvellina seminuda can transmit X-disease to stone fruits such as peaches. The species name "seminuda" means--well you can guess--half naked. There is one very similar looking species, N. novica which according to Dr. A. Hamilton, has shorter wings. 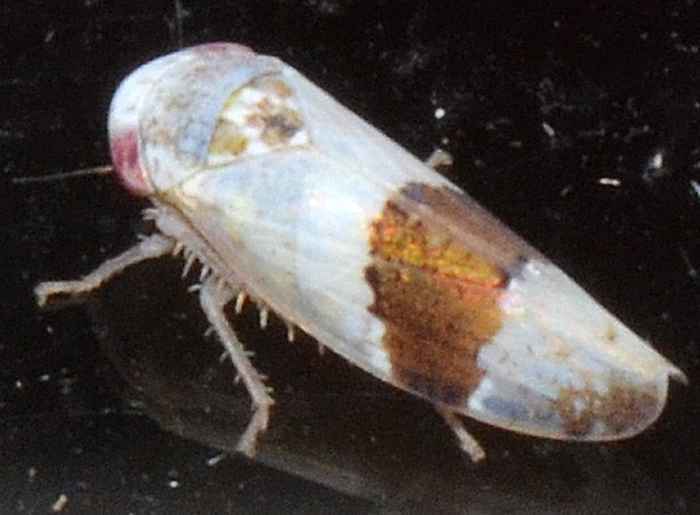 He also states on the bugguide "The brown band (in N. seminuda) varies in exact shape, but is always at least as wide as the white space between it and the tip of the scutellum. In N. novica it is narrower than that space, in part due to the longer wings."